#failurefriday imagine what you will accomplish when you change your definition of failure to mean not trying rather than not succeeding! We aren’t perfect and our bodies aren’t perfect. If you don’t dare to try something new, how will you know what you are capable of? I read that @sarablakely ‘s Dad would ask “what have you failed at this week” at the dinner table. And he would be disappointed if his family members didn’t have a weekly failure. I LOVE this and I am going to adopt this routine. Let’s be honest...if I am not failing, I am not growing! My weekly failure was not handing my business card to someone that should be a client because I didn’t want to bother them. Time to get over that 💩! Watch out world, I’m coming for you with business cards! What was your weekly failure? Eyes on the prize. Let 2018 be the year your prize is your health. Investing in yourself is the wisest of all investments. There is no way your life is going to be what you dream it can be if your body isn’t helping you. Wake up every morning as inspired to be better, to do more, and to break your own barriers as you are on January 1st. ”What is your favorite kind of patient to work with? It’s me right!? ?”...I struggled with this one for a while because the answer most people expect is physical in nature. Athletes. Kids. Shoulders. Etc. but that just doesn’t resonate with me. So I had to delve a bit farther into myself to get this answer. I see patients as young as a few months old to patients in their late 90s. Professional athletes and dancers to people with tremendous physical disabilities. And everyone in between. So the similarity isn’t a physical one. . The common link is drive. That motivation and dedication to getting better. Mindset matters. It is easy to go to the gym or work really hard when everything is going well. It is easy to have the right mindset when you are happy and feeling good. But there are those that dig a bit deeper. 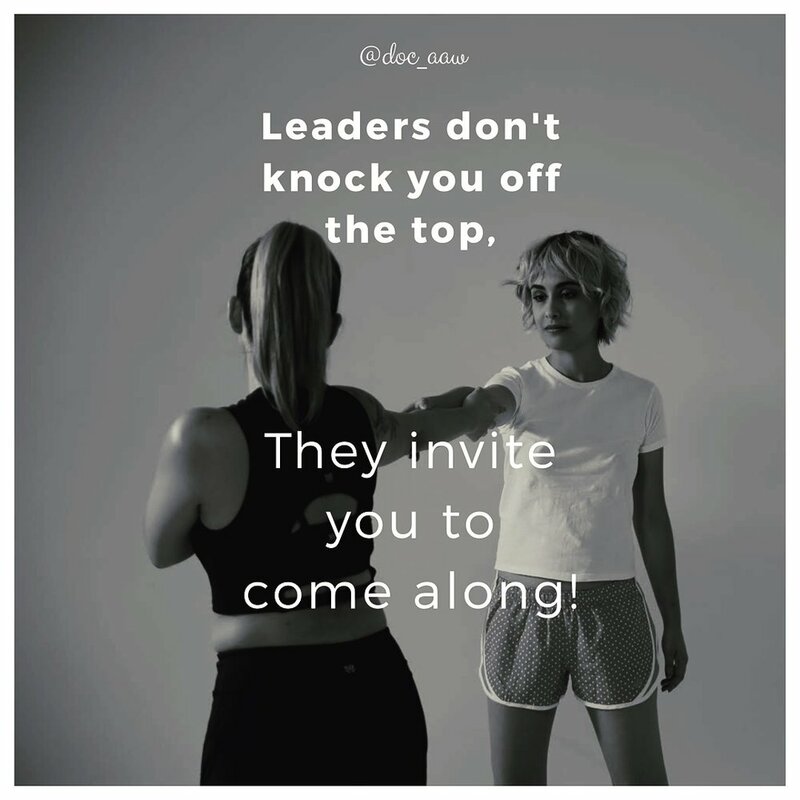 Those that are hungry to push when they are hurt. Those that want it. Want to be better. And are willing to work for it. That is my ideal patient. That is who motivates me to work harder. I can assure you that I am the kind of person that will bring 150% to everything that I do, but I need you to do the same. Any PT-patient relationship should be a partnership. You can’t do it alone. I can’t do it alone. We do it together. . The best way to get better is to learn from someone more proficient than you. Be willing to listen when someone tells you what you are doing wrong. And don’t take it personally. Stay humble, listen, and just try it. Even if you aren’t sure about it, be willing to try it. I believe that mindset is what can make your experience with PT successful. Breakthroughs happen at the point of resistance. Breakthroughs happen at the point of resistance. Allow yourself to get uncomfortable. Let them see you struggle. That is where strength is created. That is where the magic happens. A lot of people confuse Commitment and Settling. The difference is fundamentally one of action and growth. A commitment is a dedication to a cause or activity. Settling is choosing a steady or secure state. If you are choosing to do something over and over that doesn’t push you outside of your comfort zone, is that being committed or is that actually just settling? YES answers to the above are the building blocks of a commitment. NO answers are indicative of a choice to settle. There is no shame in that, but know that you deserve more. And you can do more. If you have been doing the same 3 mile route at the same pace for 5 years or have shown up to the same desk for 10 years and have not noticed any improvement or growth in your life, it is time to look at yourself and decide. Decide if you want more. The choice is yours. Do you commit or do you settle? I choose to commit myself to my patients and they choose to commit to me. Check back on Friday to hear more about how I discovered my ideal patient and why that is so important. Yes! You can, and should, get Physical Therapy even if you don't have pain! So if we may be able to head off disaster, why would we not try? If you do not have an injury or an ache/pain you are a perfect candidate for a Physical Therapy Annual Physical. Most of us go to our GP for a Physical each year to check out our insides and to the Dentist to check out our teeth so this is the same thing but to check out how your body is moving. Each PT will incorporate different elements but it should consist of a general tests for your musculoskeletal, neurologic, cardiovascular, respiratory, and vestibular systems to get some baseline values. Then, most importantly, you will be taken through some motor control drills along with some movement analysis of things that you as an individual enjoy doing to get a feel for how well all of your systems are working together. This piece is where the music happens. To a Physical Therapist, your individual body systems are like instruments and your movement is the full orchestra. And you can think of us as your conductor. We have the ability to determine which instrument is out of tune or off tempo and to teach you how to improve so that your orchestra plays as flawlessly as possible. After the tests, the PT will have an idea of where your body is doing amazing as well as some areas that have some room from growth. A simple plan of care will be developed that may include an exercise or two, an activity, or just a few pointers. If you stay diligent to these, your body, movement, and function will thank you. Think of how amazing our movement could be if we added some individualized exercises to our daily routine the way we do with brushing our teeth. We don’t wait until we get a cavity to brush our teeth so why should we wait until we have back pain to see a PT? Physical Therapy with a non- Physical Therapist?! #FAQF… “I have done Physical Therapy before but it wasn’t with a Physical Therapist. What is the difference?”… This one always surprises me but it seems to be popping up frequently in the social media world so I am going to chime in. Physical Therapy, legally, can ONLY be done by or under the supervision of a Licensed Physical Therapist. So no, your Chiro/Accu/Trainer/MD/Coach/Masseuse cannot legally claim to perform, offer, or bill you for Physical Therapy services unless they also “double” as a licensed Physical Therapist. If they do, I urge you to bring it up to them. It is for your safety. This would be like going to a Vegan Restaurant only to find out that they cook everything in Chicken Broth. Not so awesome. You probably wouldn’t go back. And you probably would write a not so friendly Yelp review. Trust and honesty are huge. If someone is falsifying what they provide, in my opinion that is a huge breach of both. And also raises the question as to why they would do that? If you are proud of what you do, why would you falsely hide behind something else? I wonder why, as a society, do we so blindly trust the things and people that work with our physical bodies yet we wear ourselves out trying to order the perfect 104degree, almond milk, green tea matcha latte to ensure we ingest only the finest? Imagine if we took the time to ask the who, what, where, and why’s for your body. Providers of any kind should be more than willing to answer any of these questions, and if they can’t or won’t I would take caution. You only get one body so please, take care of it. And take care of it with the right people. As always, feel free to ask me anything! I am here to help! 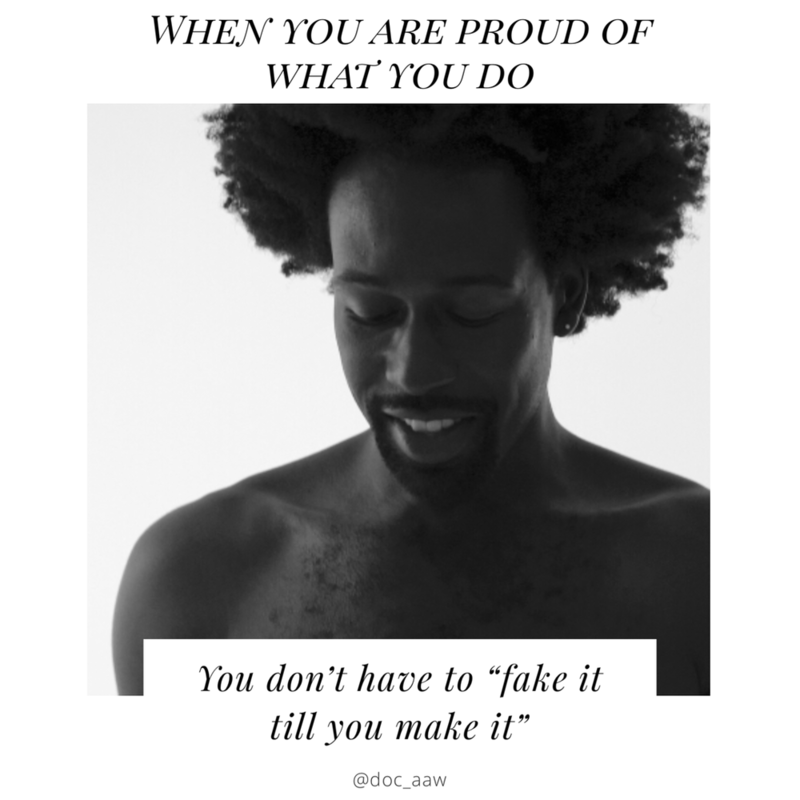 When you are proud of what you do, you don't have to "fake it till you make it"
#thoughtfulthursday...It doesn’t matter what your professional title is, if you are good at what you do, THAT is what is most important. Qualities that these types of people possess are a genuine belief in and pride in what they bring to the table. There are a myriad of choices when it comes to movement/rehab and I strongly believe that it is not about the type of service but rather the individual providing it that matters. A healer is a healer, regardless. This does confuse people so tomorrow I will be sharing a few things to be mindful of when choosing a provider. Check out @doc_aaw tomorrow for details. With any relationship, it all comes down to honesty and trust. “Making changes to my everyday routine is hard and sometimes feels weird. Can’t I just do some exercises instead?” …My answer to this is…well, sure. But that depends on you, and what you want to get out of Physical Therapy and life for that matter. I get that life in 2017 is all about finding the quick fixes and the easiest solutions, but how often does “quick and easy” result in “incredible” or “successful”. Rarely right? So yah, sure. I can give you some exercises that will decrease your symptoms, if that is all that you want. But I hope you want more. You deserve more. If you want to actually change the CAUSE of your symptoms, you will have to change your habits. This is the only real way to actually change your tissues. This is not to say that exercises aren’t helpful, but it is to say that they are only a very small piece of this life flavored pie. So, Yes! Getting uncomfortable is OK! Doing things that are hard is OK! Doing things that feel weird is OK! In fact, that is the place where the magic happens. That is where the change begins. It is amazing what we can each do when we embrace the opportunity for adaptability rather than cowering from it. The beauty of the way I run my business is that I get invited into your world. To really see you. Allowing me to find your optimal space for change. For some it is physical, for some it is mental, and for most it is a combo. But it should always be catered to you as an individual. Following some generic plan online diminishes your own individuality. Do you only buy generic brand items or medications? Well then why buy into someone else’s generic brand movement plan? Embrace the fact that your body is one of a kind and start treating it that way. You literally only get one body. One self. I urge you to get the best out of it that you can. Trust in the fact that as humans we were built to survive. Built to live up to the challenge. So, hell yah I WILL invite you to do something hard. I WILL invite you to do something that feels weird. And I WILL invite you to live up to your potential. Do not quit on yourself just because it is uncomfortable. Be patient. Change takes time. he Opioid crisis is spiraling out of control but there is something we can do about it! It has been clinically proven time and time again that Physical Therapy is more effective than prescription pain meds (Opioids). And results in better quality of life as it actually fixes the problem rather than masking it. This epidemic knows no age, race, gender, socioeconomic group nor educational level. No one is immune. It starts out as harmless prescription meds to help with some pain but for over 64,000 people in 2016 it ended in death. We need to advocate for our own health and protection. 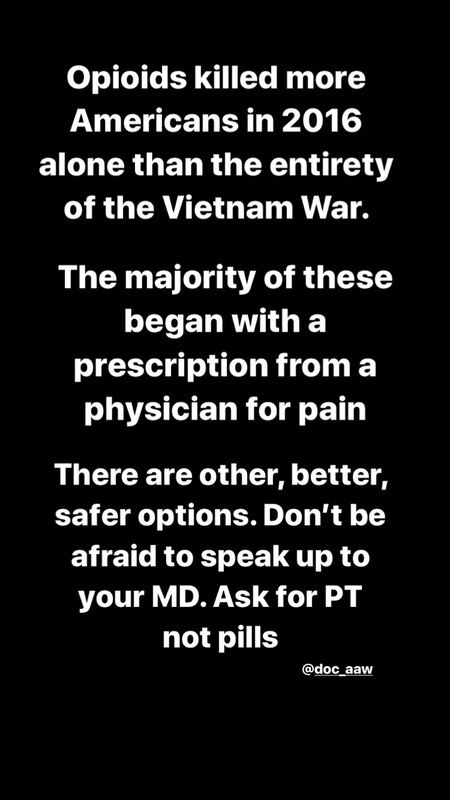 Speak up when your Physician is prescribing meds for pain. Ask for PT, not Pills. "Pain is an opinion" states VS Ramachandran, a neurologist and scientist. The quote continues with..."pain is an opinion of the organism's state of health rather than a mere reflective response to an injury"
Pain is the ultimate display of a mind body connection. It is a mosaic of our individual body's strengths, injuries, emotions, fears, movements, knowledge, and perceptions. We need to address the bio-psycho-social components as well as the Physical tissue damages to see lifelong change. Work with someone that will support you in progressing all of these areas. Not just someone that wants to put a bandaid on the problem. Check back tomorrow for some real life examples of this concept. The research disproving René Descartes' 1654 pain model is as cohesive as that against the world being flat. 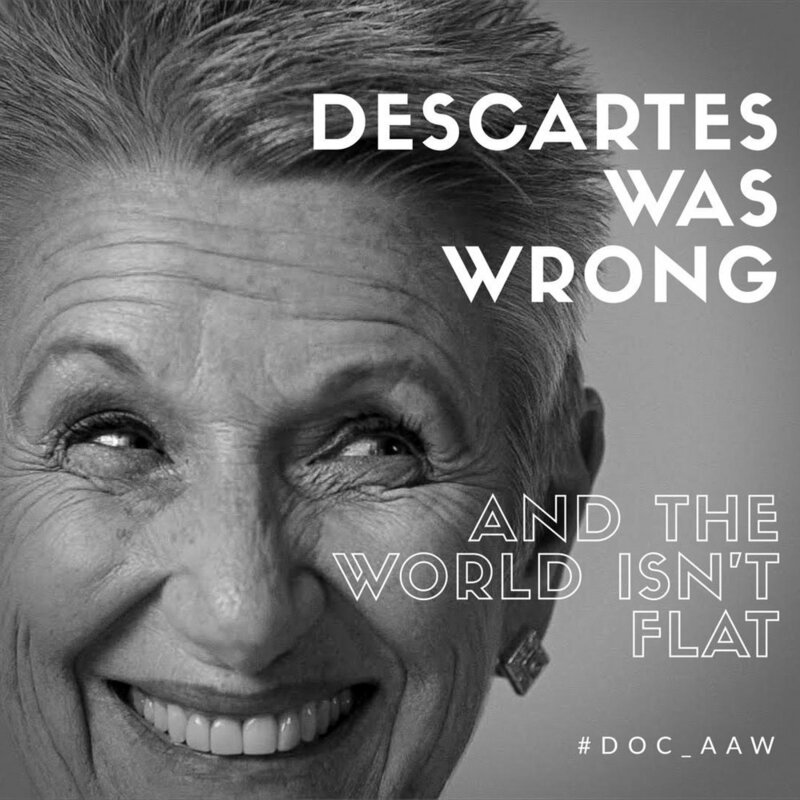 Follow @doc_aaw for some modern truths about pain! What is wrong with Descartes model? There is no such thing as a "pain" nerve. It does not "detect" pain. It does not "send" pain. The nerve detects some sort of change to the tissue. It sends a message of "danger" to your brain. Your brain weighs the situation based on numerous past events and sensory information and determines how much danger you are in. Your brain THEN sends your nerve a message telling it how to react. Pain is a complex, instantaneous conversation. A two way street. Not a one way valve. See my story today for more info on this process! 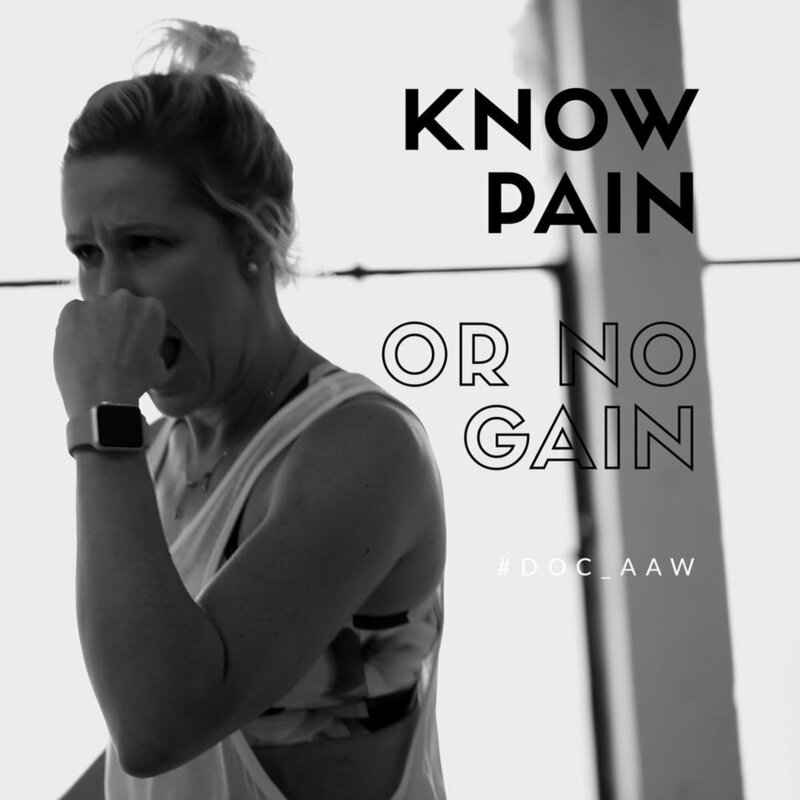 Follow @doc_aaw this week to get to Know Pain! The first step to knowing pain is recognizing that there is no pain without the brain. Your brain uses a compilation of all your previous experiences, knowledge, sensory information, etc to determine the "appropriate" pain response to a threat. Sometimes this system malfunctions 🤷🏼‍♀️Luckily, it is possible to re-train your brain to be more levelheaded (pun intended). We need to stop thinking of pain as having one cure or one source if we really want to change pain. I know you can, but do you?